For their eighth season, Brooklyn Art Song Society is presenting La France, a series of recitals of French art song, a thorough exploration of France's contribution to this compelling art form--a happy marriage of text and music--a condition in which the whole is greater than the sum of its parts. Last night's well chosen program focused on the music of two titans of this art form, Claude Debussy and Maurice Ravel. The latter was born in 1875, fifteen years after the former and thus his music belongs squarely in the 20th c.
Founder and Artistic Director Michael Brofman not only performs on the piano but wrote the extensive and informative program notes which taught us things we didn't know. For example, we have heard Ravel's cycle Don Quichotte a Dulcinee many times and Jacques Ibert's cycle Chansons de Don Quichotte only twice without knowing the full story. Here it is, courtesy of Mr. Brofman. Film director G.W. Pabst commissioned the cycle for a film he was directing and Ravel's ailing health prevented him from completing the commission; it was then given to Ibert. The three songs Ravel finished were published as a cycle. We are glad to have both! He also explained why both Debussy and Ravel decried the use of the term Impressionism to describe their music. Their precise compositional style is anything but vague and perceptual but rather deep and descriptive. Beware the tendency to categorize! 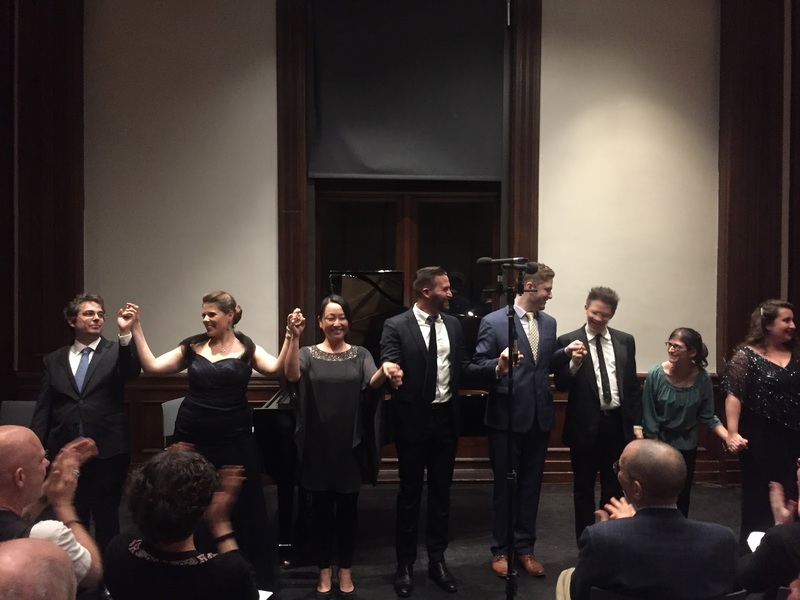 For last night's exploration of Ravel and Debussy, Mr. Brofman assembled a stellar group of singers, all of whom are familiar to us and cherished for their contributions to vocal performance. The French was impeccable all around and the Gallic style was consistently captured. The first half of the program was devoted to the melodies of Debussy. His cycle Chansons de Bilitis belongs to our all time favorites and was finely realized by mezzo-soprano Samantha Malk, whose consummate artistry made the subtleties of interpretation seem natural. We remember well the first time we realized that the three songs represent stages of a woman's life and that the singer must evolve from the innocence of girlhood through the sensual passion of young adulthood and on to the disillusionment that comes through the destruction of a shared dream. This was achieved by Ms. Malk in a way that seemed effortless, with shifts from delicacy to the expansion of tone during the heights of passion. Miori Suiyama's pianism shifted right along with her in perfect partnership. Did we mention that Ms. Malk has a gorgeous instrument with which to accomplish this? Accompanied by the wonderful Brent Funderburk on the piano, baritone Steven LaBrie entertained us next with the cycle Fetes galantes. The program notes list Mr. LaBrie as a lyric baritone but we heard a lot more going on in terms of texture and resonance. Undoubtedly his voice has grown since we first heard him several years ago and our companion thought he was headed toward bass-baritone. Whatever you call it, we found it mature and rich. We particularly enjoyed the skillful variety of dynamics in "Clair de lune" in which Mr. Funderburk's piano limned moonlight, splashing fountains, and birdsong. In the first melodie "En sourdine", there was an unmistakeable nightingale in the postlude. To soprano Kristina Bachrach fell the responsibility of bringing out all the melancholy of the cycle Ariettes oubliees, featuring the poetry of Paul Verlaine (also featured in Fetes galantes). These are mood pieces with "C'est l'extase langoureuse" evoking feelings of sensuality and languor. Gallic melancolie permeated "L'ombre des arbres" and "Spleen" evoked desperation and vaguely unsettled feelings. It takes a true artist like Ms. Bachrach to do justice to this cycle with its many shades of grey. Only the central song "Chevaux de bois" is filled with energy. The gayness is deceptive and seems to be masking deep seated feelings of the futility of life. Mr. Brofman's piano was particularly evocative there as the wooden horses turned round and round and, in "Il pleure dans mon coeur", as his fingers made the drops of rain fall. The second half of the program was devoted to the works of Ravel and we were completely thrilled by baritone Jesse Blumberg's storytelling in the cycle Histoires naturelles, settings of text by Jules Renard. In this cycle, creatures are anthropomorphized for our delight and amusement. The texts are perceptive and indicates the poet's response to each critter. Along with a true lyric baritone that falls beautifully on the ear, Mr. Blumberg is the possessor of considerable dramatic skills, preening like the peacock of "Le paon", gliding smoothly over the surface of the water like "Le cygne", and tormenting other fowl with defensive intent in "La pintade". Who has not had a special feeling of privilege when a wild creature comes close! The fisherman in "Le martin-pecheur" has just had that special moment and Mr. Blumberg and Mr. Brofman at the piano shared that moment with the audience. Ms. Malk returned for the cycle Chansons madecasses which is rarely performed because of the unusual instrumentation necessary to create the exotic environment of Madagascar. Jill Sokol contributed to the multiple sonorities with flute and piccolo with Chris Gross' cello filling in with its own sensuality. Ms. Sugiyama has the softest hands and plays with delightful delicacy. The multiple sonorities blended into a sea of sensuality in "Nahandove". "Aoua" is a painful anti-colonial rant and "Il est doux" describes a man lying about wanting entertainment and food from the women. The melody was haunting. The final cycle was the aforementioned Don Quichotte a Dulcinee performed by Mr. LaBrie and Mr. Funderburk. The range was a perfect fit for Mr. LaBrie's voice and he sang with deep commitment to the music and the text. "Chanson romanesque" is romantically worshipful whilst "Chanson epique" is spiritually devotional. The final song "Chanson a boire'" is usually performed by the baritone pretending to be inebriated and staggering around the stage. Mr. LaBrie's take on it was more a celebration of joy and we liked that spin a great deal. There will be four more concerts this season at the welcoming Brooklyn Historical Society which is easily reached by multiple subway lines. There will also be a bonus concert on December 1st at the Old Stone House, a charming venue. B.A.S.S. keeps ticket prices low so that everyone can enjoy these recitals, which are always well planned and equally well executed. Those who come at 7:00 can avail themselves of lectures by experts in the field. One always sees a packed house!